Upper Mustang Cultural Trek takes you away from the known to an unknown world, which is loaded with the cultural mysteries. The hidden landscape is not only barren, but also dotted by the sandy rocks and caves. It is located above the Annapurna region and you follow the dusty Kaligandaki River bank to reach the stone walled Lo-Manthang, which is the main destination of the trek to Upper Mustang. The trail to Upper Mustang is less technical, but the sandy dust cannot be underestimated. The trek begins from Jomsom and crossing some of the high passes like Takma La Pass (3624 meters), Yamda La Pass (3850 meters) and Nyi Pass (4010 meters). Right from the beginning of the Mustang region, trekkers find the villages influenced by the Tibetan Buddhism. It continues reaching to Lo-Manthang, the spiritual center. Throughout the trail, the appreciating red monasteries, chhortens and mani walls can be explored. The mysterious caves and people with ethnic traditions prospect the perfect blending of nature with culture. Nepal Kameleon Holidays organize cultural treks to Upper Mustang with a side trip to the significant villages around the Mustang region. It is a place, where people’s lifestyles and professions are connected to the religious beliefs. Tiji festival is what they celebrate with a great dedication and is highly renowned. Day 15: Drive from Jomsom to Pokhara and Pokhara city sightseeing. Day 16: Drive/fly back to Kathmandu. Day 17: Bhaktapur and Patan sightseeing, farewell dinner. Pick up and drop, Airport - Hotel - Airport by private vehicle. Hotel accommodation in Kathmandu and Pokhara in twin sharing basis with B/B plan. Three meals during trekking (Breakfast, Lunch and Dinner). Lodge based accommodation during the trek. Professional trekking guide and porter, their food, accommodation, salary and transportation. ACAP (Annapurna Conservation Area Project) entry permit. Upper Mustang restricted area entry special permit. Drive from Kathmandu –Pokhara-Kathmandu by tourist vehicle. Pokhara - Jomsom flight, Jomsom - Pokhara drive. All our government taxes and office service charges. Entrance fee in all monuments during tour in Kathmandu and Lo- Manthang. Alcoholic drinks, hot drinks and cold drinks. Mineral water, chocolates and energy bars. Every year, around May, the Tiji festival held in Upper Mustang (in Lomanthang). 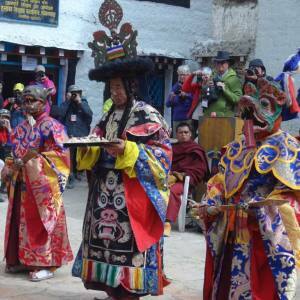 If you want to make a cultural festival trek to Lomanthang, please let us know. We operate the trek focusing the festival and let you feel the hidden world and their mystical practices. Please, find the fixed departure for the Tiji festival trek to Upper Mustang. Day 02Kathmandu sightseeing and trek preparation.Breakfast at the hotel. Then we set out for the sightseeing tour in Kathmandu, exploring some of the unique monumental sites that are enlisted in the World Heritage Sites of UNESCO. Swayambhunath (Monkey Temple): The temple is located at the top of the hill in Kathmandu, which is a 5th century religious significant site. It is regarded as a self-sprung monumental site. For the Buddhist pilgrimage trip or tour in Nepal, Swayambhunath stupa remains the first selection in the Kathmandu valley. One of the UNESCO monumental sites, Swayambhunath is also popular as the monkey temple, having uncountable monkeys. Newari Buddhism is one of the major features here, which is known as Vajrayana. The eyes of Buddha represent wisdom and compassion. To climb the steps up the hill top is believed to be the ladder to lead you to the state of enlightenment. Pashupatinath Temple: The temple is one of the most sacred and popular pilgrimage destination for the Hindu devotees around the world. It is located on the banks of the holy Bagmati River, about 5 km distance at the east of the valley. It is listed as UNESCO site and travelers love to explore the 15th century arts and architectures around the area of the temple. It has got wonderful pyramid shaped temples, extensive cultural heritages, Ashrams for the old people and Sadhus along with remarkable inscriptions. It is very special during the Shivaratri festival and nearly one million people visits the Pashupatinath temple every year. Boudhanath Stupa: Boudhanath Stupa is located about 10 km east of the Kathmandu, which is antique and a huge mandala. The stupa is one of the biggest among this type. The surrounding of this stupa is dominated by the Tibetan refugee settlements. One of the prominent World Heritage Sites in the Kathmandu valley, Boudhanath is a highly adored tour and pilgrimage destination. Buddhist monks and devotees can be seen to be doing religious way of paying homage around different corners of the Stupa within. Day 14Walk from Chhuksang to Jomsom (2700 meters). 6-7 hrsAt the last walking day, we begin to walk from Chhuksang after the breakfast. 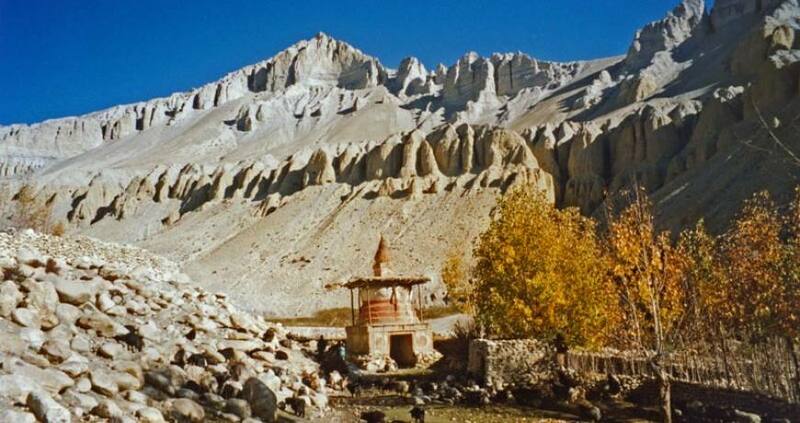 First, we reach to Kagbeni, from where we took a route of Upper Mustang. Meeting the Annapurna circuit trail, we walk through the Kali Gandaki River bank, gradually to Jomsom. It’s time to celebrate the success of the trip. Overnight at lodge.